At least 24 people were killed at a Pakistani restaurant today by a suicide bomber. The bomber had a message taped to one leg that was found in the wreckage that said all spies for America would meet such a fate. 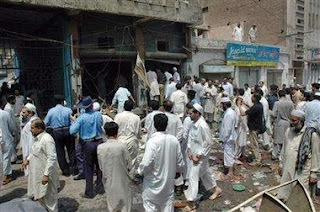 A hotel blast in Pakistan’s northwestern city of Peshawar on Tuesday left 24 people dead and 25 injured, police said. A suicide attacker detonated a bomb that ripped through a crowded hotel restaurant. The blast deepened instability in Pakistan, still reeling from bloody political riots during the weekend in its commercial capital, Karachi. However, the attack appeared unrelated to that unrest. Provincial police chief Sharif Virk said investigators had found the legs of the suspected suicide bomber, with a message taped to one leg that spies for America would meet such a fate. Peshawar is the capital of North West Frontier Province, a region bordering Afghanistan where pro-Taliban and al-Qaeda-linked militants are active. Virk said below the message attached the leg was written the word “Khurasan” — a Persian word often used in militant videos to describe Afghanistan.